Speakers at the launch of the ‘Maximising the Value of Apprenticeships to Wales’ at the Senedd (from left) joint author Nicky Perry of Beyond Standards, Kirstie Donelly, group managing director of City & Guilds / ILM, DigitalMe, Jack Sargeant, AM for Alyn and Deeside, Ken Skates, Minister for Economy and Transport and Sarah John, NTfW chair. 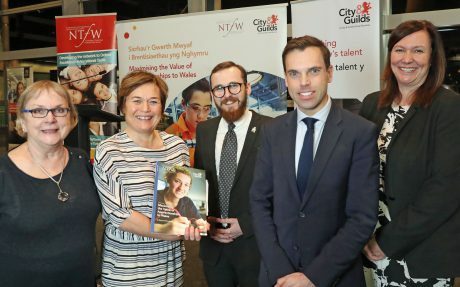 Former engineering apprentice Jack Sargeant, AM for Alyn and Deeside, who sponsored the report launch, said: “This is a timely report and an opportunity for the Welsh Government to consider how they continue to maximise the impact of apprenticeships as we head into the next industrial revolution. NTfW chair Sarah John said: “The NTfW recognises that significant progress has been made in recent years to the Apprenticeships Programme in Wales and that the programme is in a constant state of transition. However, we also recognise that more can be done to improve the quality of the overall programme if we are to continue to meet the needs of individuals, employers and the wider Welsh economy. Jane Russell, people manager for Morrisons, said: “I am really looking forward to reading this important report and seeing what we can take from it for our business. Out of the 23 shops in our region, 15 have apprentices and we hope to take on more in the future.